ALL old towns have local legends which are handed down from generation to generation until in time they become accepted as factual and Maybole is no different from other towns in this respect. Every Minnieboler is reared to believe that the King of the Gypsies eloped with a Countess of Cassillis and after the enraged Earl caught up with the elopers he hanged the gypsy and his followers on the Dule Tree at Cassillis and imprisoned his errant spouse in the old castle at the foot of the High Street for the rest of her life and the room with the oriel window facing up the street is pointed out to this day as the "Countess’s Room". "They cuist the glaumourye ower her." But love has a glaumourye for the eyes much more powerful than that supposed of old to be practised by wandering gypsies, and which must have been the only magic used on this occasion. The Countess condescended to elope with her lover. Most unfortunately ere they had proceeded very far, the Earl came home, and, learning the fact, immediately set out in pursuit. Accompanied by a band which put resistance out of the question, he overtook them, and captured the whole party, at a ford over the Doon, still called the Gypsies’ Steps, a few miles from the castle. He brought them back to Cassillis, and there hanged all the gypsies, including the hapless Sir John, upon "the Dule Tree", a splendid and most umbrageous plane, which yet flourishes on a mound in front of the Castle Gate, and which was his gallows-in-ordinary, as the name testifies. As for the Countess, whose indiscretion occasioned all this waste of human life, she was taken by her husband to a window in front of the Castle, and there, by a refinement of cruelty, compelled to survey the dreadful scene—to see, one after another, fifteen gallant men put to death, and at last to witness the dying agonies of him who had first been dear to her, and who had imperiled all that men esteem in her behalf. The particular room in the stately old house where the unhappy lady endured this horrible torture, is still called "the Countess’s Room". After undergoing a short confinement in that apartment, the house belonging to the family at Maybole was fitted for her reception, by the addition of a fine projecting staircase, upon which were carved heads representing those of her lover and his band; and she was removed thither and confined for the rest of her life—the Earl in the meantime marrying another wife. One of her daughters, Lady Margaret, was afterwards married to the celebrated Gilbert Burnet. While confined to Maybole Castle, she is said to have wrought a prodigious quantity of tapestry, so as to have completely covered the walls of her prison; but no vestige of it is now to be seen, the house having been repaired (otherwise mined) a few years ago, when size-paint had become a more fashionable thing in Maybole than tapestry. The effigies of the gypsies are very minute, being subservient to the decoration of a fine triple window at the top of the staircase, and stuck upon the tops and bottoms of a series of little pilasters, which adorn that part of the building. The head of Johnnie Faa himself is distinct from the rest, larger, and more lachrymose in the expression of the features. Some windows in the upper part of Cassillis Castle are similarly adorned; but regarding them tradition is silent." Such is the legend of the love-lorn lady and her gallant gypsy which all Minniebolers swear to be true, but "facts are chiels that winna ding" and the truth is there is no truth in the story. It is impossible to know what authority Chambers had for identifying the lady in the case with Jean, sixth Countess of Cassillis, and documents in existence to this day prove him wrong in every point. Cassillis the 15th Dec., 1642". If, as Chambers states, the Earl had imprisoned his erring wife in Maybole Castle and bigamously married another woman it is strange that a ‘devout member of the Assembly of Divines should be so hypocritical as to refer to "my deir bedfellow" when inviting Lord Eglinton to attend her funeral. While the sixth Earl did in fact marry again it was not until February, 1644, more than a year after the death of Lady Jean, that he married Margaret, only daughter of William, tenth Earl of Errol and widow of the eldest son of the first Duke of Roxburgh. It was by this marriage that the heir to the title, John, seventh Earl of Cassillis was born, as the son born to Lady Jean died during the sixth Earl’s lifetime. Surely these facts alone entirely disprove Chambers’ story of the elopement but there are other errors in his description of the affair. He speaks of a room being added to Maybole Castle with an oriel window with carved heads representing Johnnie Faa and his men and would seem to indicate this was built to house the Countess during her imprisonment but this staircase and room was in existence long before Lady Jean’s day. 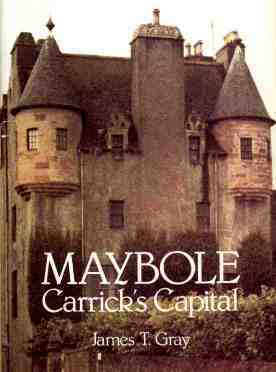 He also adds she was imprisoned for the rest of her life in Maybole Castle whereas there is proof she died at Cassillis in December, 1642. Chambers is also wrong in placing the "Gypsies’ Steps" over the River Doon as "a few miles from the Castle" as they are only a few hundred yards below Cassillis House. When fact is placed against fiction in this case, as always, fact must conquer and whilst the story of Johnny Faa and the Countess will, it is hoped, continue to be handed down to future Minniebolers, the truth must be remembered and the character of the much maligned and "wanton lady" redeemed. There may be some grounds for believing that the story is founded upon a reality, however, and that the main features of the tragedy are based on some incident in history long before Lady Jean’s time as there is a well-known old ballad of "Johnnie Faa" with many versions which tells the story of a noble knight who loved a lady before she married another and who disguised himself as a gypsy and captured his lady love when her husband was away from his castle. This ballad was sung all over Scotland at one time but differed slightly from district to district. Some versions start "The gypsie’s cam’ to our gude lord’s yett," others "The gypsie’s cam’ to the Castle yett" and the version most common in Ayrshire "The gypsie’s cam’ tae Cassillis yett". It is therefore natural to associate the ballad with Cassillis and an easy step to link the name of Lady Jean with Johnnie Faa who was by no means an imaginary character. He was in fact the head of the Egyptians, or Gypsies, in Scotland and he was granted a letter under the Privy Seal from James V, dated 15th February 1540, establishing his authority over all the gypsies in Scotland and calling on all sheriffs in the country to "assist him ‘in executione of justice upoun his company and folkis." Tradition has it that Johnnie Faa and his men did from time to time stay in the district and is said he had a camp near Culroy—"the glen of the king." (An interesting old local story tells of a member of the Faa clan, Roy by name, quarrelling with his wife, Minnie, when she lifted a knife and ran at her man. Their son stepped in between them and cried "Na, na, Minnie sham kill Roy," and thus arose the names of the two villages Minishant and Culroy). Taking the fact that Johnnie Faa did at sometime live near Culroy, within a mile or two of Cassillis, it is understandable that the ballad of "Johnnie Faa" should be linked with the name of a lady of that house.